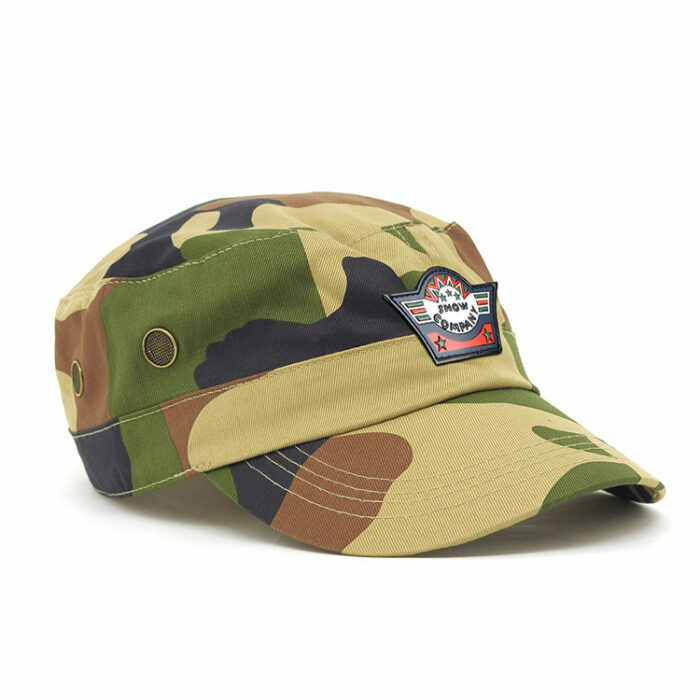 Using military patterns, the custom printed Camo Military Cap will make your logo stand out. With super good pricing and bulk discounts your budget is always looking good. Military caps are great promotional product alternatives to the commonly featured baseball caps. 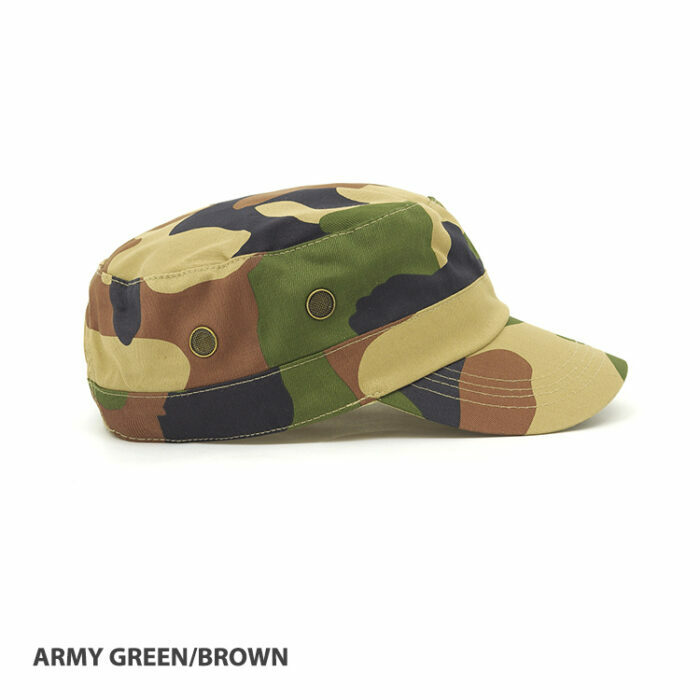 The custom Camo Military Cap in particular looks refreshing with its flat-topped design and camouflage pattern. It is fabricated with premium cotton twill, a sturdy fabric with a fascinating pattern. 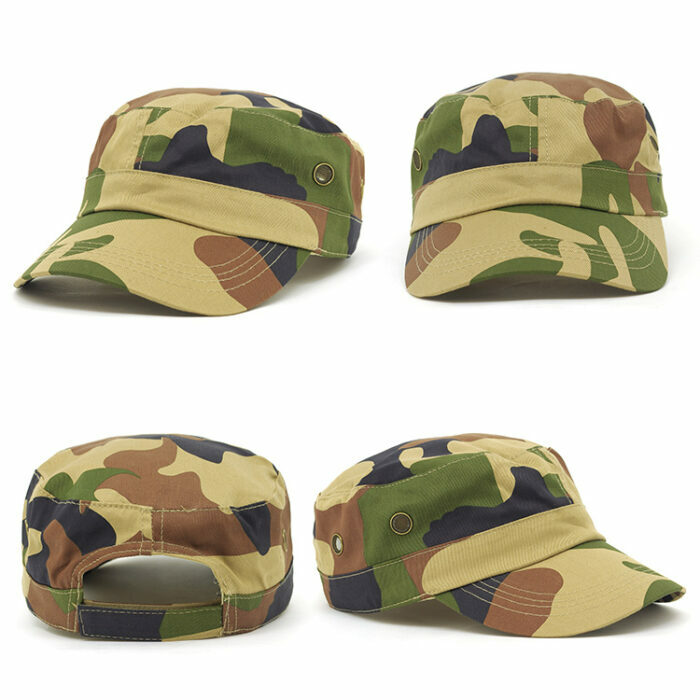 If you look closely at the fabric of the branded Camo Military Cap, you’ll notice diagonal lines arranged in parallel pattern which is produced by the characteristic twill weave. This pattern reinforces the sturdiness of the material. 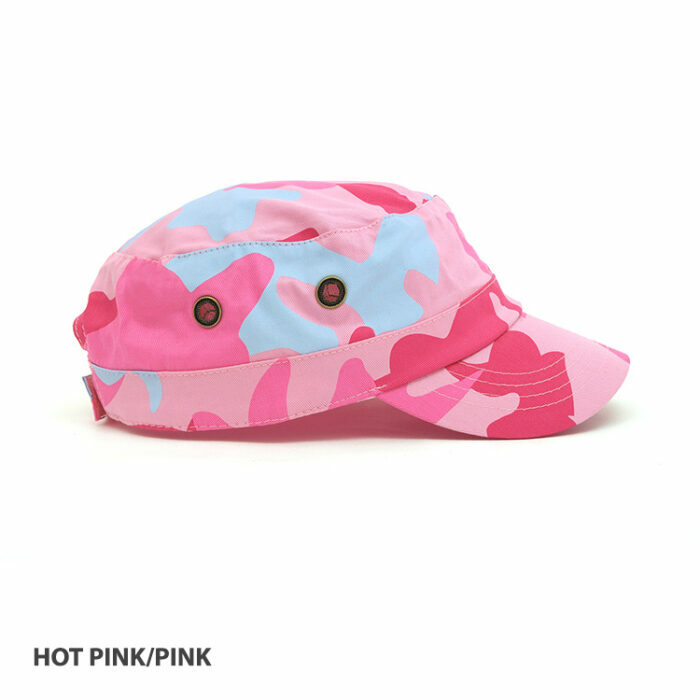 The customisable Camo Military Cap comes in camouflage pattern with two different hue combinations: army-green with brown that will appeal to men and hot-pink with pink that will fascinate ladies. The cap also has dual metal eyelets on both sides for ventilation and a cross-over fastener at the back for size adjustment. We will embroider your logo to the front, back or sides of the cap and your custom made cap is all set. 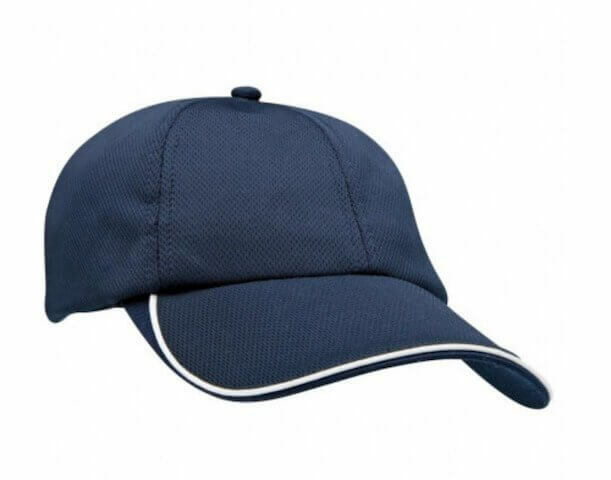 Instead of embroidery, we can also print your logo to the front panel of the cap if preferred. If this cap’s camouflage pattern is not what you’re looking for and you’re interested with the emerging digital camouflage model, we do have that as well. We have the custom Ripstop Digital Camouflage Military Cap which is made of another durable material, the ripstop fabric. Or if you want a military cap style but not really feeling the camouflage pattern, we have the monochromatic promotional Ripstop Military Cap available in black, white, charcoal and khaki. Snap to attention with our promotional cotton Camo Military Cap. 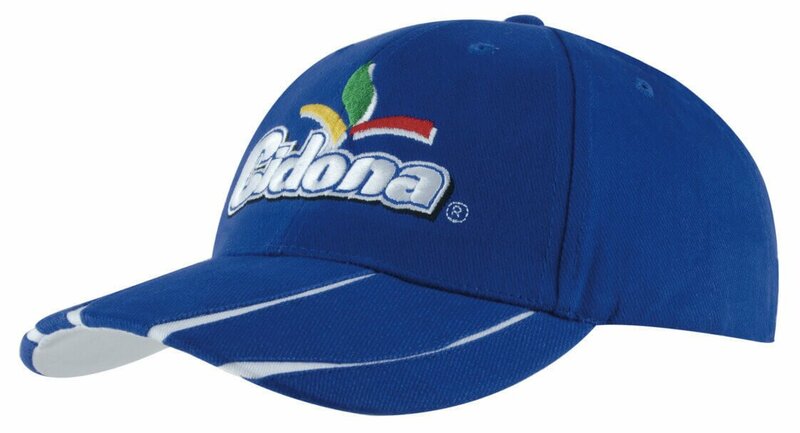 This hat is perfect for your outdoor as well as casual indoor marketing events. You can add another fun twist to your advertising with our Bulk Chocolate Poker Chips, and our other customizable confectioneries. We have a huge variety of promotional headwear including classic baseball caps, distinctive military caps, functional bucket hats, comfortable beanies and inexpensive visors so if you’re not finding a personalised hat from our website that fully fits your criteria, please get in touch and we’ll strive to provide what you’re looking for. Reach out to us at 1300 008 300 or via live chat. You may also request a quote by filling out our Custom Quote option.